I hope you like rock because you’re in for a serious yam session with these sweet potato nachos. If you’re wondering how the recipe could possibly top that joke, trust me, it gets better. 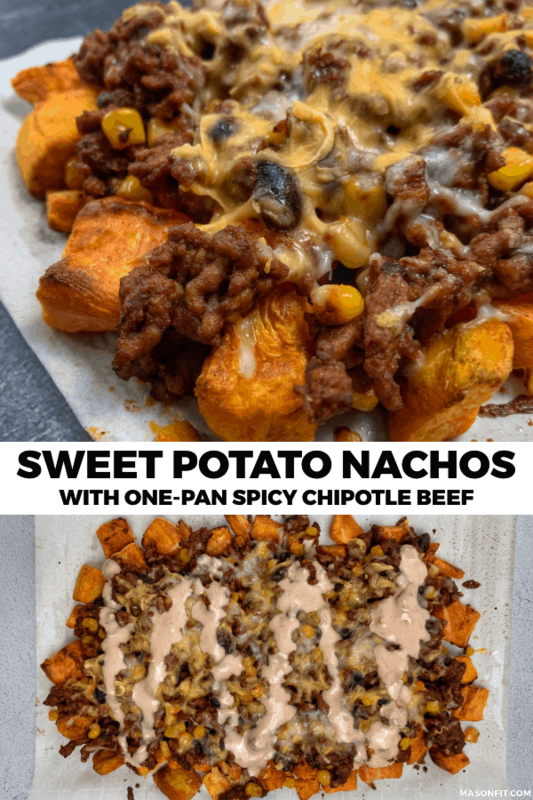 With a super flavorful chipotle beef mixture sitting on top of crunchy on the outside, fluffy on the inside sweet potatoes, these nachos will be the perfect addition to any nacho lover’s rotation. And in terms of nutrition facts, you’re looking at 215 calories, 17 grams of protein, 27 grams of carbs, and only 4 grams of fat per serving. It’s as simple as roasting some sweet potatoes and throwing beef and spices in a pan. For real. 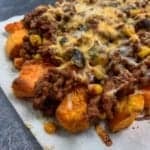 These sweet potato nachos were one of my accidental recipes that stemmed from a failed attempt at making a creamy taco seasoning. 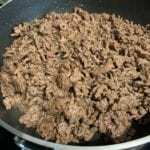 My first experiment resulted in a taco meat that was too spicy to enjoy. The sweet potatoes, corn, and black beans were all added as last minute spice buffers. And the sweet potato nachos were born. Oh, and I’ve turned down the heat from my first experiment. This recipe should be perfect unless you’re extra sensitive to spice. The chipotle beef portion of the recipe may look lengthy, but it’s super easy. Simply brown some meat, add a handful of things to a blender before adding to the meat, add some corn and beans, and you’re done. If you wanted more heat, I probably wouldn’t add more than two tablespoons of extra chipotle peppers unless you’re a spicy foods savant. Just kidding. There’s no such thing as the perfect sweet potato for sweet potato nachos. It’s totally up to you on how you’d like your potatoes. You could peel and cube them like in this recipe, slice them thin like chips with the peel on, or even use pre-cut potatoes. I’ve included grams in the measurement for nutrition facts accuracy since no four potatoes will weigh the same. 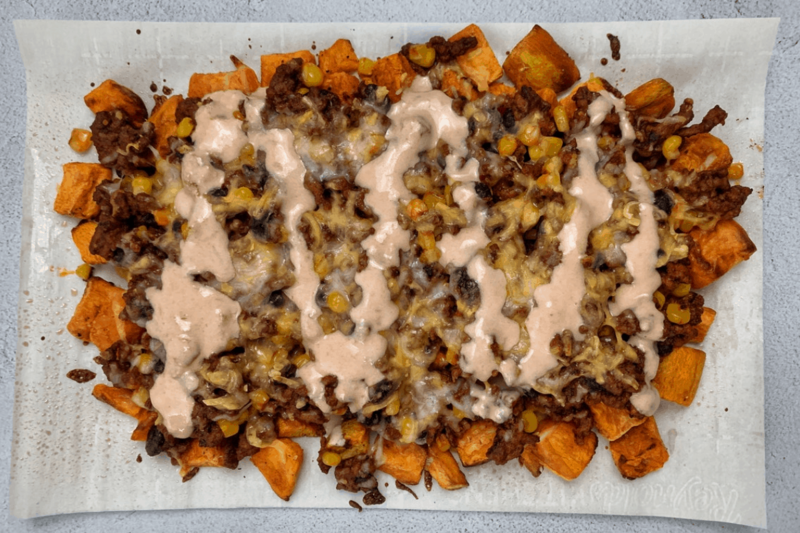 The base recipe doesn’t call for oil, but you could add a bit of olive oil in addition to salt and pepper to make your sweet potato nachos base even crispier. And if you wanted to make extra crispy chips for your sweet potato nachos, check out my air fryer potato chips recipe (also covers cooking in the oven) for tips on slicing and cooking for max crisp. You’re a bowl of fat free Greek yogurt mixed with your favorite salsa away from elevating your topping game. 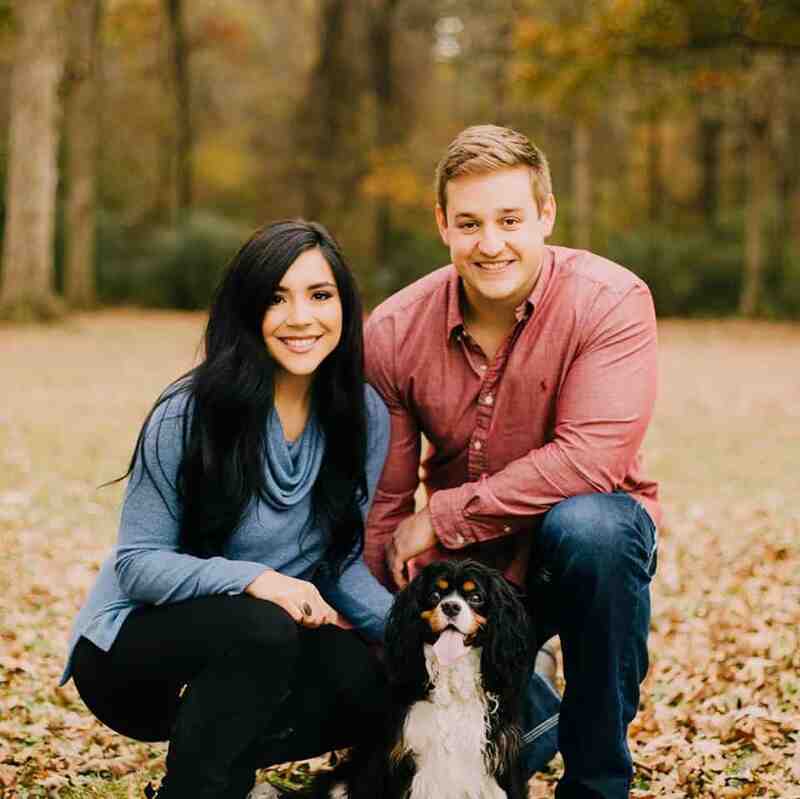 I’ve used it for my healthy Gordita Crunch, taco salad, and a long list of other recipes on my blogs. The proportions are entirely up to you and may vary slightly based on how thin the salsa is. But I like to start with a 2:1 Greek yogurt to salsa ratio. I used 1/2 cup (113g) Greek yogurt and 1/4 cup (60g) salsa for these sweet potato nachos. You can add more salsa if you’d like a thinner salsa dressing. I’ll include any other ingredient notes I can think of in the recipe card below. 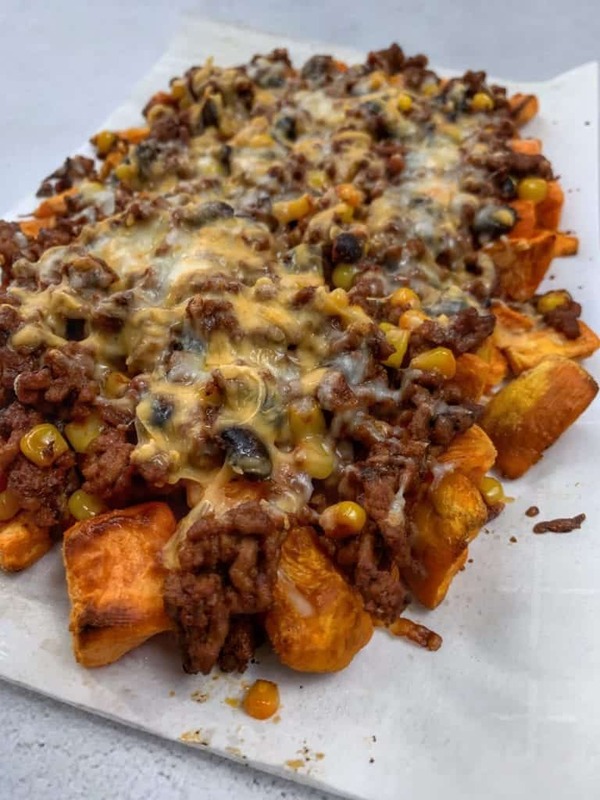 If you make these sweet potato nachos, I’d love to see your creation. Grab a photo and tag me on Instagram @mason_woodruff or join the Facebook group and share it with everyone. 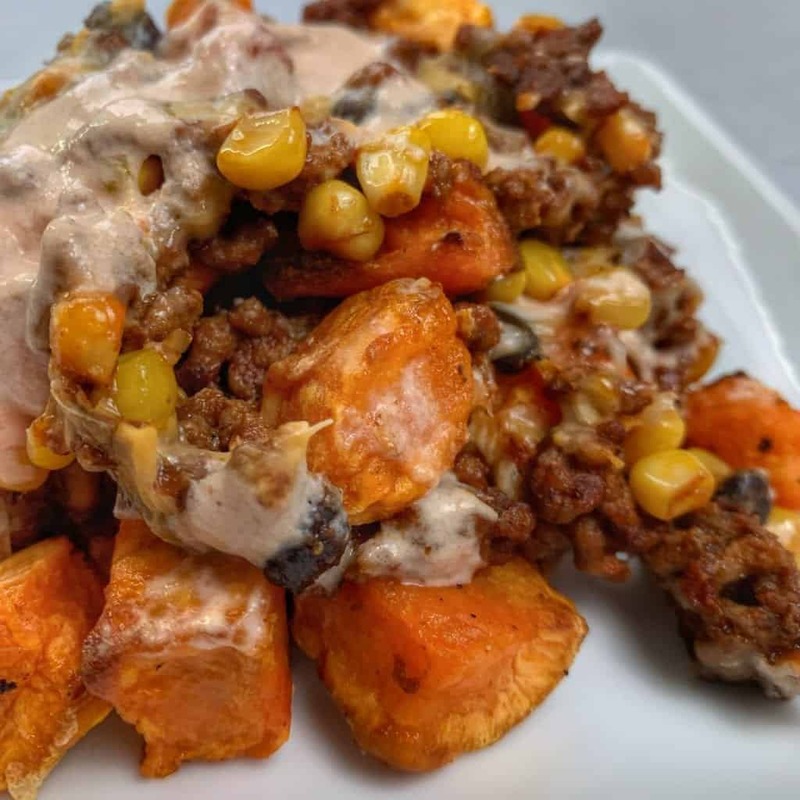 Crispy sweet potatoes topped with a one pan spicy chipotle beef mixture, shredded cheese, and a creamy salsa. 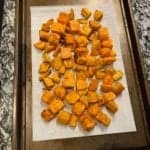 Wash the sweet potatoes before cutting them into 1" cubes (or slice them if you'd rather have chip-shaped potatoes). Spray them with nonstick cooking spray and add salt/pepper to taste before placing on the baking sheet. Roast for 15-20 minutes or until the potatoes are as crisp as you'd like. While the potatoes are in the oven, add the ground beef to a large skillet over medium-high heat. Add salt/pepper to taste. 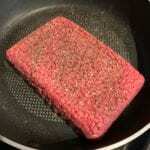 Cook the ground beef until no pink remains. While the ground beef cooks, add the chipotle beef sauce ingredients to a blender or processor. Pulse until smooth before adding to the beef. Add the black beans and corn and simmer over low heat until the sweet potatoes are ready. 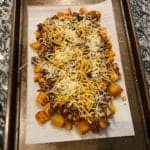 Once the sweet potatoes are crispy, add the beef and sprinkle with cheese. Bake for an additional 3-5 minutes or until the cheese is fully melted. Top with creamy salsa, sliced avocado, or your choice of toppings. 1 serving = 1/8 total recipe. I don't have the weight for each serving, unfortunately. If you'd like weights for precise servings, weigh the sweet potato nachos as a whole and divide their weight by 8. For the creamy salsa topping, mix 1/2 C (113g) plain fat free Greek yogurt with 1/4 C (60g) salsa. Not included in the nutrition facts. 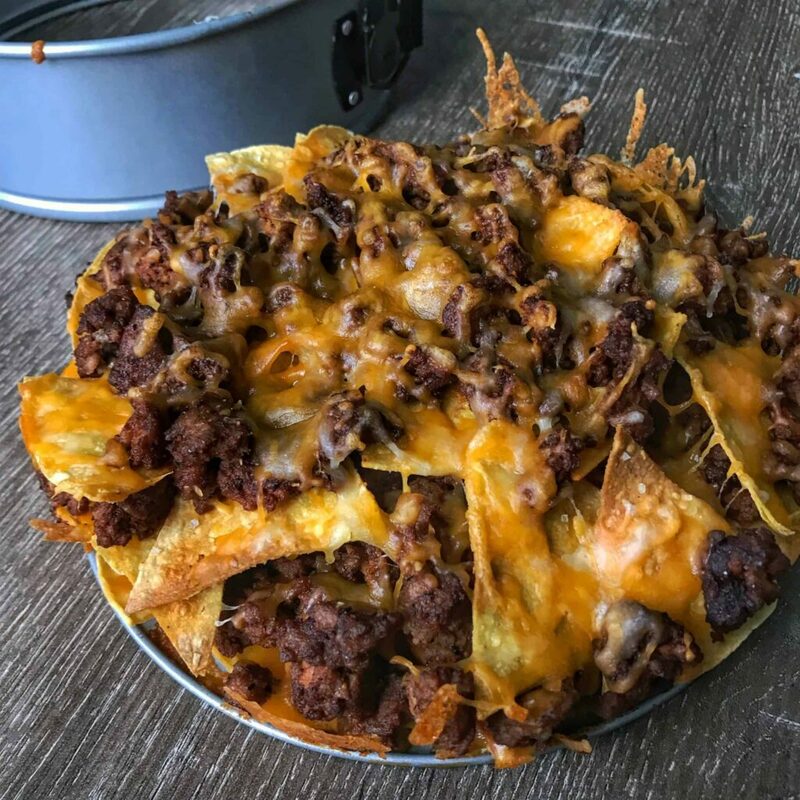 My homemade chorizo and beef nachos are on a bed of lower calorie tortilla chips. If you’re a nacho enthusiast, these are a must try. 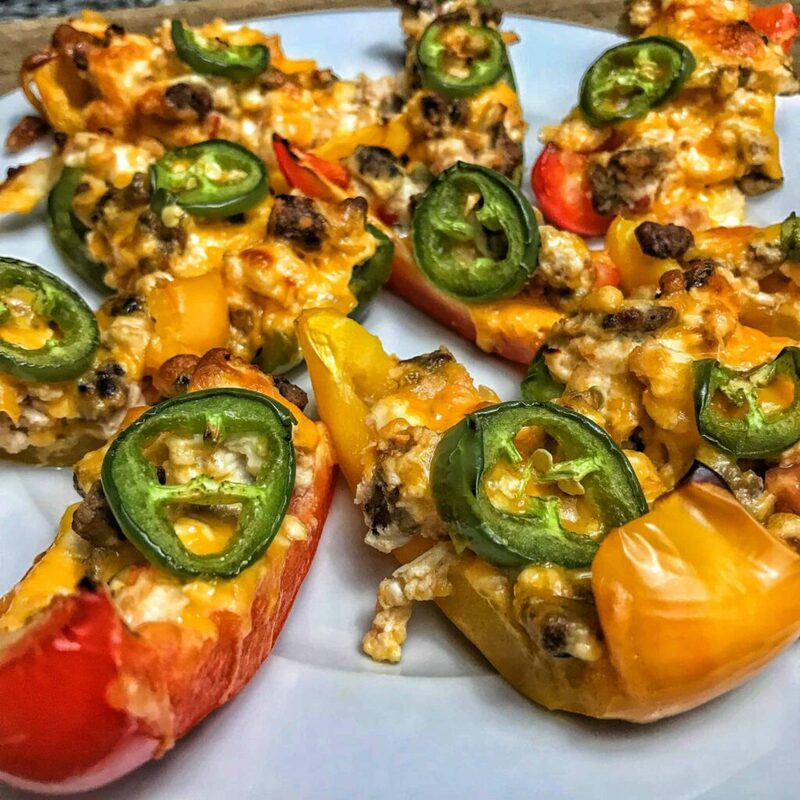 And my high protein breakfast nacho boats pack creamy egg whites inside sliced peppers for a low carb breakfast. There’s a restaurant that I go to that have a carne asada fries, which is basically this recipe but regular potatoes. I LOVE carne asada fries but I’ve never thought of using sweet potatoes instead. I definitely need to give your recipe a try soon, thank you! Same here. Hope you enjoy this rendition! I love nachos and this is a perfect lower carb version. The Chipotle Peppers in Adobo Sauce makes the meat a little spicy but is a perfect pair with sweet potatoes. Plus, using sweet potatoes over chips is a lot more filling because let’s be honest, eating regular nachos we can get a little out of control with portion control but this definitely filled me up and was flavorful. Legitimately my favorite recipe of Mason’s. Look, I was skeptical about sweet potatoes in a Mexican-style dish, but it just WORKS. This recipe has become a weekly staple in our home. A tip: I tried several different implements to blend the chipotle beef sauce, and found that my mini food processor works the best. I tried both an immersion blender and a magic bullet-style blender, and both of those left the peppers almost whole in some cases. I already have a can of Chipotle Salsa on hand. Would that work in a pinch? Oh yeah, that should work fine! THIS CHIPOTLE SAUCE is life altering !! Put it on everything . I made these for supper last night and holy cow—they are delicious!!! To start, I LOVE sweet potatoes so any recipe involving sweet potatoes catches my eye. 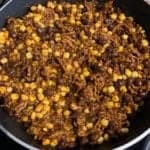 The meat mixture is super delicious, with just enough heat to make enjoyable! The sweetness of the sweet potatoes also blends so well with the slickness ofnthe meat! Another great recipe! !